I had read enough to know that Brettanomyces Bruxellensis Trois (WLP644) is the most common strain used in beers like this. With this beer I decided I wanted to go with something fruity and tropical so I decided on Galaxy hops, then paired them with Simcoe to get the grapefruit and pine. This beer was brewed right before the local bulk grain buy so I was running low on 2 row (after brewing my Ten Fidy clone) so I was forced to substitute most of my grain bill with Pearl. I had also just run out of Crystal 45L, so I just went with the closest I had, which happened to be Caramunch III (65L). I used my usual Magnum US bittering hop, and threw a little bit of Cascade in for good measure. The brew day was fairly straight forward. I mashed in with 163.1°F water, and the temp settled in to 150.5°F. I figured this was a bit low so I added 0.75 qt of boiling water and brought it up to 151.8°F. Even though I had added 2.8 mL of lactic acid into the strike water, my mash pH still measured out to 5.67 pH, so I added another 1.5 mL and that brought it down to 5.51 pH, this is why having a pH meter is important. Doing water calculations theoretically doesn’t always work in the real world situation. Most calculators just have you select between base/roast/crystal malts then input the mass and the colour. This wouldn’t account for the difference in acidity between Canadian 2 Row and German Pilsner Malt, if there is one. After the mash, vorlauf, and sparge I had collected 7.25 gallons of 1.046 wort, right on target! The boil proceeded as usual, netting 6.25 gallons (@boiling) of 1.056 OG wort in the kettle at the end of the boil. I started the whirlpool and chilled down to about 170°F before I turned off the chilling water and added the flameout hops. I let the flameout hops whirlpool at that temp for 20 minutes before turning the chilling water back on chilling the rest of the way down to 64*F. I decided to use a glass carboy with this batch instead of my usual better bottle because I didn’t want to chance infecting my other brews with brett, plus it was just sitting around asking to be used. About 6 days before brew day I had made a starter using the vial of WLP644 and let it go for a full 4 days, then I crashed it in the fridge for 2 days. I had been told that brett takes longer to grow it’s cell count so I let it go for 4 days instead of my usual 24 hours before crashing. Brett is also less flocculant than saccharomyces so I crashed for 48 hours hoping that I wouldn’t lose too many cells when decanting. Back to brew day now, I pitched the brett into the carboy and then oxygenated for 90 seconds. That may have been a bad move since I didn’t end up with many esters. After 9 days I took an SG reading and it had only attenuated down to 1.014 SG so I decided to let it be for a bit longer. I took another reading 10 days later (Nov 16th) and it had dropped a bit lower to 1.010 FG. I decided that even though this wasn’t the calculated 1.006, it was low enough and transferred it into my new dry hopping keg. A few months earlier I read a blog post by Bear Flavoured and it inspired me to change up my dry hopping method. I had previously been using a stainless dry hopper, but I hadn’t been as pleased with the results as I had hoped. I also found that I was getting a lot of small hop bits floating in the beer. Instead I decided that I would dedicate a keg to dry hopping, even if it was going to be more work. 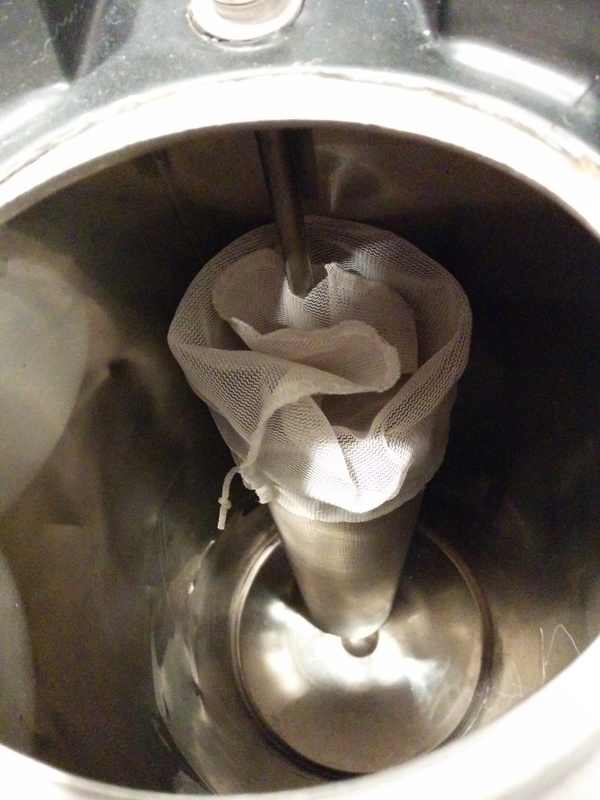 I bought a liquid diptube and cut off the last 2 cm so that it would fit in the keg with the stainless filter (from the dry hopper). I also attached a dip tube filter. One improvement I implemented was to slide a nylon dry hop bag over the large screen so that no hops could come in from above. This setup is all stainless so I am not too worried about dry hopping both brett and clean beer in it. 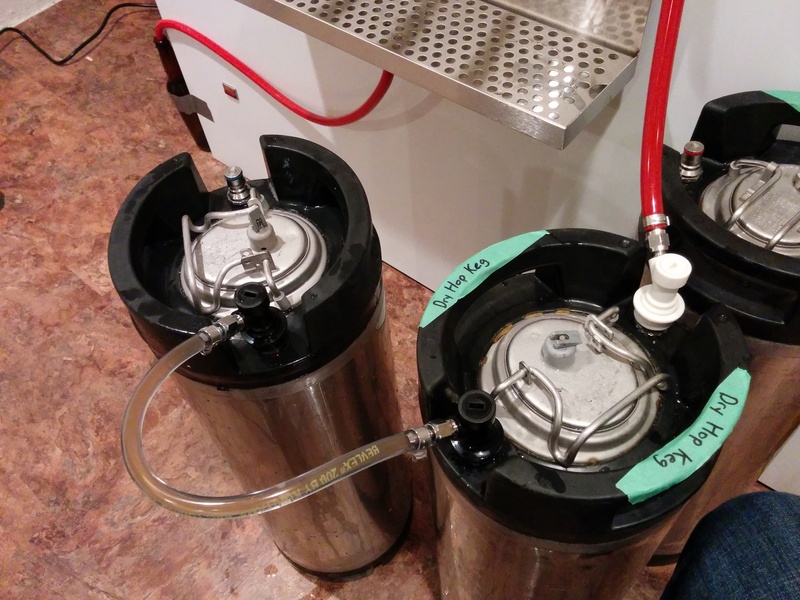 On Nov 16th I sanitized, purged, then siphoned the beer into the dry hop keg. Then I dumped the dry hops in and purged again. The dry hop keg all set up to be sanitized and receive beer. After dry hopping for 3 days I placed the keg in my keezer to cold crash for 2 days before racking into the serving keg. On Nov 21st I carefully lifted the dry hop keg out of the keezer and put about 2 PSI on the dry hop keg to help push it into the receiving keg. I was pleasantly surprised to see clear beer flowing through the jumper hose. I made sure to excessively purge the receiving keg, then I left the pressure valve open so that there wouldn’t be a build up of pressure and slow down the transfer. The setup for transfering from the dry hop keg. After the keg was full, I put it on 25 PSI for 2 days to help speed up carbonation before setting the regulator to 12 PSI to help finish up and avoid over-carbonation. All in all I am happy with the way this beer turned out, it is a bit hazier than I would have liked, but that is probably because it has only been in the keg for a week and a half, plus you know it’s an unfiltered brett beer. The levels hop flavour and aroma came through very well, however the brett came through cleaner than I had anticipated. I suppose that should have been expected with a 100% brett brux trois fermentation, I guess I was just expecting it to be distinctly brett. 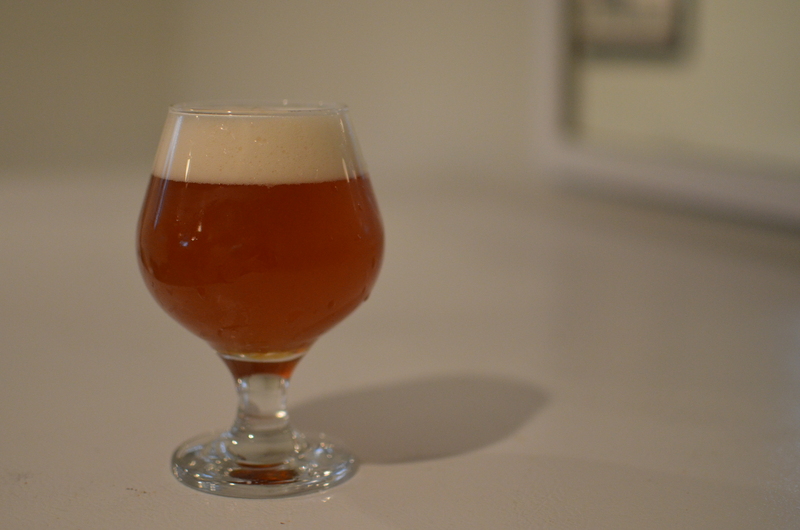 I am planning to brew a Brett IPA for the wedding, so I will probably just tweak this recipe. Would definitely go back to 2 Row as the base malt, and probably replace with Caramunich III with another crystal malt, right now I’m thinking either C15 or Fawcett Crystal I (45L). Hopefully my fellow club members enjoy the beer, I know I do. Here’s a bonus picture of what was left in the dry hop keg after transferring. Lots of sludge! 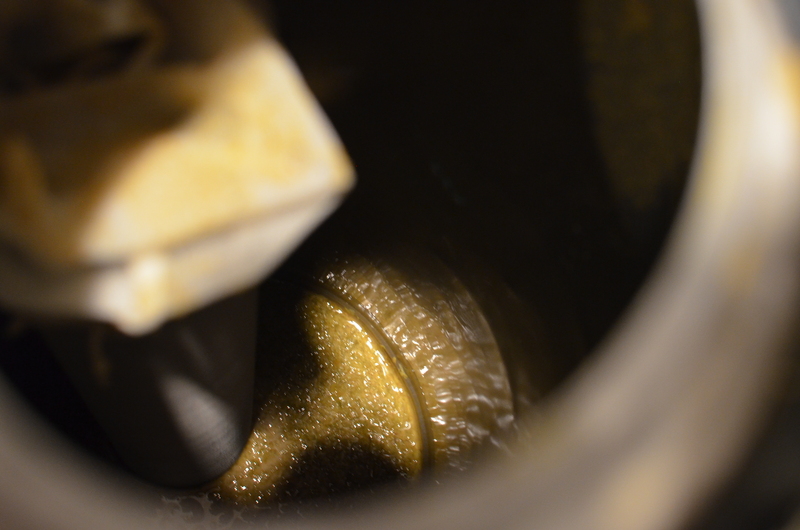 After transferring the beer into the serving keg, all that was left was the hop sludge. Trois is a great primary yeast, I bet it paired very well with Galaxy. Lucky club members! I’m planning a re-brew of this in a few weeks and I’m thinking that I will swap the simcoe out for mosaic. I find mosaic to be much fruitier than simcoe so it should go well, plus I love fruity IPAs a lot. I had Victory’s Hop Ranch earlier this year and the Mosaic/Azzaca combo was magic, need to try that combo in an IPA soon. Actually I just went back and looked at my recipe and mine was mosaic 30′, mosaic 10′, falconer’s flight 10′, and cascade 10′. Falconer’s flight is some sort of a really nice fruity blend of hops, and it all came together with a huge mango fruit flavor. Quite delicious as I recall- I don’t think you’ll be disappointed with the substitution. Oh, and one other tip I used accidentally at the time: lactic acid is a precursor compound to one of the fruity compounds Brett is capable of synthesizing (it cannot make it without the lactic if I recall correctly). So, consider acidifying a bit with lactic acid or acid malt. As a bonus, Brett apparently ferments a bit better with a slightly lower pH. Wow, quite the compliment! I’m flattered. Thanks for reading!